Since the use of internet expanded from just downloading pirated songs and videos to being officially used by businesses, the function of this portal which is accessible to everyone all over the world has changed completely. Today the internet is very controlled and there are many organizations which have involved their services to make it a secure place and probably one of the best places to shop from a small needle to as big a thing as an SUV. Hence the internet is the best place to open your store and there are already hundreds of them operating but this doesn’t mean you should be discouraged from opening your web store. Starting a business of any kind would be a success only if it has been perfectly planned in advance. Since you will be the boss, the owner of the web store, you need to make sure you leave enough spare time for you to concentrate on the more important aspects of your life and business career. Hence you need to hire a virtual office assistant so that your operational costs remain low, and you get everything organized perfectly while you have the time to spend outside the office too. Since your business is based on the internet it is a very viable option to choose your team of workers who are ready to provide their services over the internet from their own remote setup. When a business is starting up, it needs to be pampered like a small baby. The more money invested in it the better it gets but if the business owner starts spending the money on other people, it gets neglected. Hence it is always the best thing to keep operational costs low and invest the money in the business by bringing in the latest technology and more products which are in demand to increase the sales and revenues. Hiring a team of employees inside the office would result in a huge investment just to build up the office and it would leave little or no money to be invested in the business further. This activity is eliminated when the virtual office assistant is hired because when he is providing the services without compromising the quality of work from his remote place, you don’t have to spend a dime to set up the office for your team. You get the office already prepared and the team of professional ready to start working on your web store. 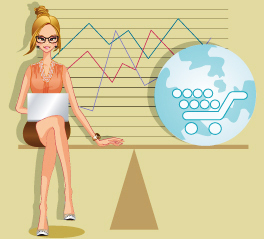 Now you have all the money and time to search about for ways to increase business on your web store. Take a stroll around the wholesale market and their websites and see all the things you can purchase to strengthen the worthiness of your store on the internet. Offer all the goods which are in high demand and you’ll get the number of visitors you weren’t really expecting right in the start. This entry was posted on Friday, May 2nd, 2014 at 12:53 pm	and is filed under Virtual Assistant Services. You can follow any responses to this entry through the RSS 2.0 feed. You can leave a response, or trackback from your own site.